Residential mREITs are one of the hardest high-yield industries to do well in over the long-term, which is why I generally avoid owning them. 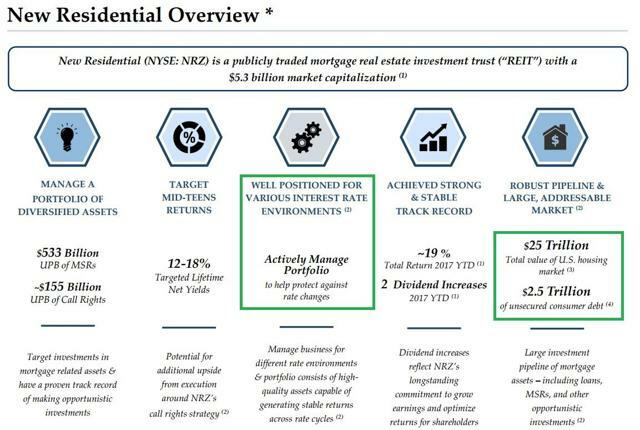 However, I’ve made an exception with New Residential Investment Corp. (NRZ), because of its highly profitable niche, which means that it’s thriving in a challenging market environment that is grinding down its peers. Let’s take a look at how NRZ is capable of delivering blow-out growth quarter after quarter, as well as impressive book value and dividend growth. More importantly however find out why NRZ remains a high-risk stock, and one that I’ll be trimming substantially before the next recession when a combination of factors could put the dividend at risk of a severe cut. Fortunately, there are several key trends you can watch to help minimize the chances of being caught unawares when the next economic downturn strikes. New Residential Investment Corp. was spun out of Fortress Investment Group back in 2013, and since then has been one of the fastest growing residential mREITs in the country especially compared to more traditional peers such as Annaly Capital (NLY) and AGNC Investment Corp. (AGNC). 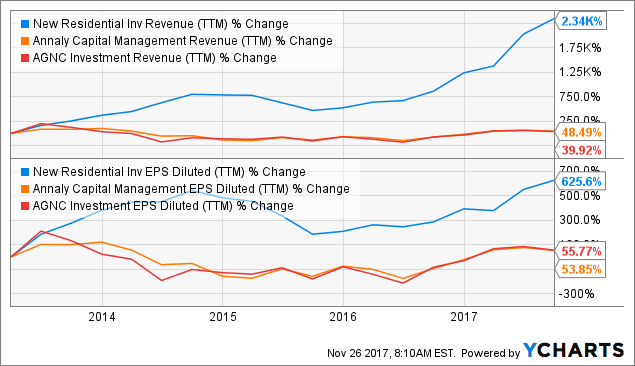 The key to this torrid growth has been the niche nature of its business model, which is essentially a hedge fund that specializes in mortgage servicing rights (MSRs), excess MSRs, mortgage advances, and unsecured consumer debt. As I’ll explain later, the nature of these loans is riskier than most traditional residential mREITs, but results in extremely high returns on investment. Mortgage servicing is basically where a third party (non originator) owns the rights to service a mortgage, meaning collect payments from homeowners, as well as handles any delinquencies and foreclosure proceedings. New Residential actually outsources this to several counterparties, including Ocwen Financial (OCN), which it recently bailed out in a $440 million deal that will greatly reduce its subservicing costs, and resulted in last quarter’s blow-out 100% earnings growth (due to a one-time accounting change). However, this quarter, New Residential proved that its continued fast pace of new loan acquisitions can indeed continue an impressive growth rate, at least for now. That’s because the overall markets in which New Residential operates are staggeringly large ($27.5 trillion), and thus pose a rich hunting ground for the top-notch management team to continue to find new and highly profitable investment opportunities. This is precisely what New Residential has been doing with very steady large purchases of new servicing rights over the past few quarters. 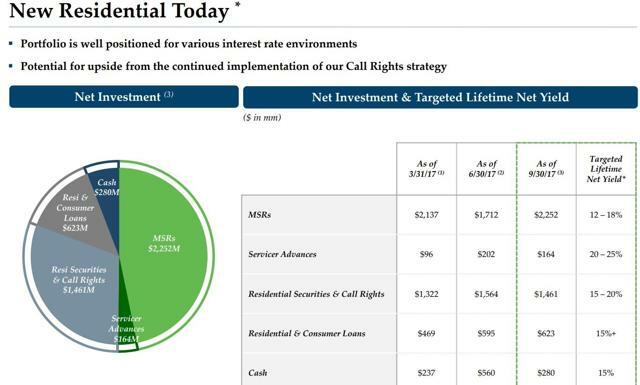 In addition, New Residential has also been growing its call rights business, as well as its portfolio of unsecured consumer loans at a breakneck pace. 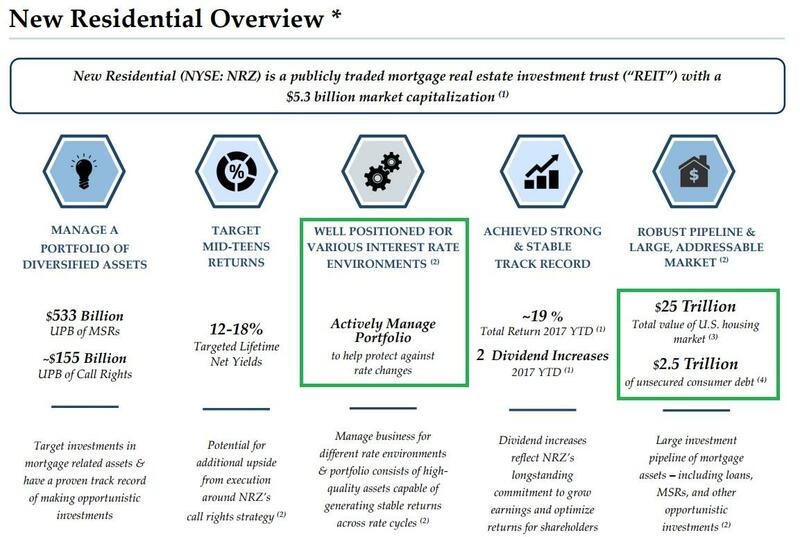 However, what truly stands out about New Residential’s business model is that unlike most residential mREITs, which are being hammered by a compressing yield curve (more on this later), and declining book value, NRZ’s loan portfolio is among the best suited to survive and prosper in a rising rate environment. 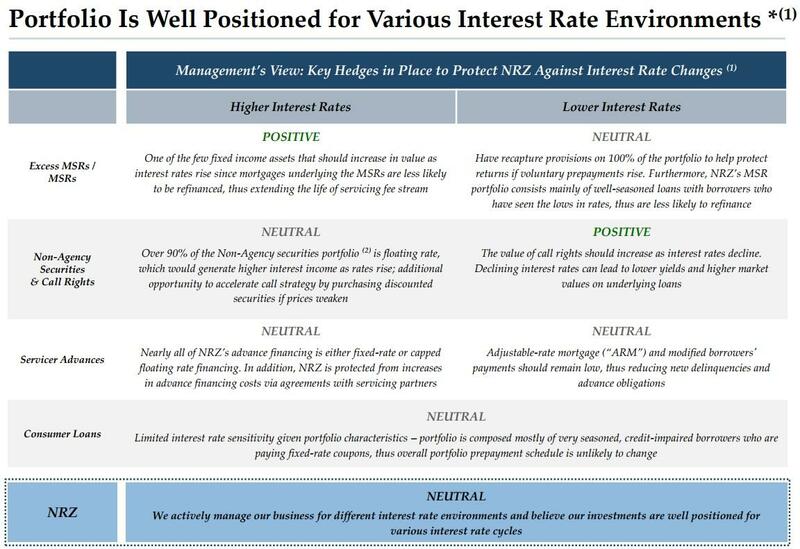 In fact, NRZ has seen its book value per share steadily rise over time, while rivals such as Annaly and AGNC have struggled with decreasing BVPS because higher rates decrease the value of their assets and a compressed yield curve makes it harder to replace maturing loans with equally profitable ones. Declining delinquency rates on its loans. Rising value of its MSR assets (due to rising rates lowering debt prepayments). Plentiful opportunities to grow its high-yield loan portfolio. Steady and accelerating economic growth (helps keep delinquencies and defaults low). This is why New Residential has been able to generate the industry’s best dividend growth record since its IPO. 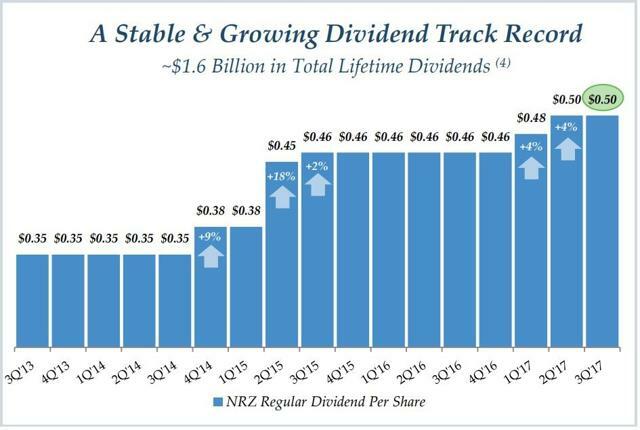 And with earnings growth continuing to rise quickly, it’s likely that for as long as NRZ continues to bask in these positive fundamentals, investors may be looking forward to even more dividend growth in the years ahead. However, while all these beneficial trends make NRZ one of the largest holdings in my high-yield retirement portfolio, there are nonetheless numerous pitfalls that still make this a high-risk stock, one that I plan to eventually trim substantially ahead of the next recession. 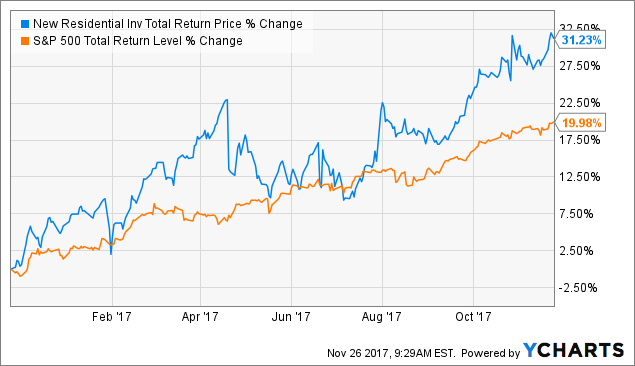 There are three major risks to keep in mind with New Residential that in my opinion make it a high risk stock, and why I plan to eventually lower my position (over time) to 2.5% of my portfolio. The first is that this is essentially a hedge fund, where management pays itself first and foremost. Base fee is 1.5% of gross equity, which it defines as the equity of the original spinoff, plus net proceeds of stock offerings (selling new shares). Incentive fee of 25% of adjusted funds from operations (basically net interest income adjusted for asset sales), above a 10% growth hurdle rate. Now I’m not necessarily opposed to management getting well paid for the kind of success we’ve seen so far. After all NRZ’s generous yield, and industry leading dividend growth have resulted in returns since its IPO that not only just crushed its larger peers but also handedly beat the market as well. However, the rate of management incentive pay has been growing even faster than either NII, Core EPS, or dividends. Now it’s actually normal for management pay to increase this quickly, given the growth rate and rapid rise in shareholder equity (which boosts the base management fee). In other words, because of how NRZ is structured (as a hedge fund paying itself 1.5% and 25%), management pay is likely to rise much faster than investor gains. However, while this is less of an issue today, when growth is proceeding at a torrid pace, high management pay could well become a major growth headwind in the future. Which brings me to the second biggest risk for the stock, replacing its maturing loan portfolios. Remember that New Residential is basically a collection of loans, and those mature and roll off over time. That means that going forward NRZ’s growth will almost certainly slow as its asset base grows larger (harder to grow quickly once you get to a certain size), and proportion of maturing loans rises over time. 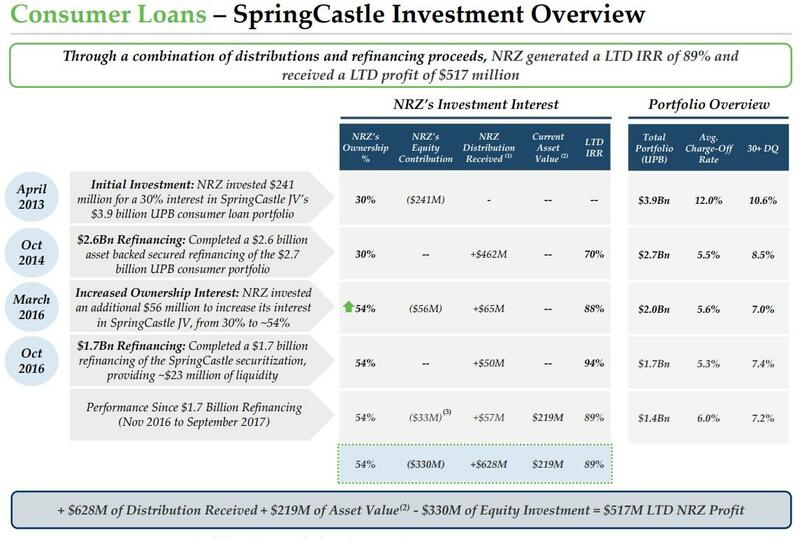 For example, take the mREIT’s most successful investment, the SpringCastle portfolio of unsecured consumer debt. NRZ has been able to generate astonishing 89% returns on this portfolio because since it purchased the risky loans (at great prices), the strong economy has caused the charge-off rate to fall 50%. However, newer consumer loans, while still highly lucrative, have been far less impressive. For example, NRZ’s Prosper portfolio of peer-to-peer loans has only generated 20% returns so far. Combined with the fact that management has said it’s passing on a growing number of MSR deals, and it may very well be that the same improving economic conditions that are benefitting NRZ’s book value right now, is making it harder for management to find sufficiently profitable deals to keep the growth rate at today’s high levels. That’s especially true given that NRZ has always been focused on riskier loans, with a focus on smaller sizes, lower FICO scores, and older loans (that will mature faster). In addition we can’t forget that NRZ’s access to growth capital has been greatly aided by the fact that its shares have historically traded at a premium to book value. 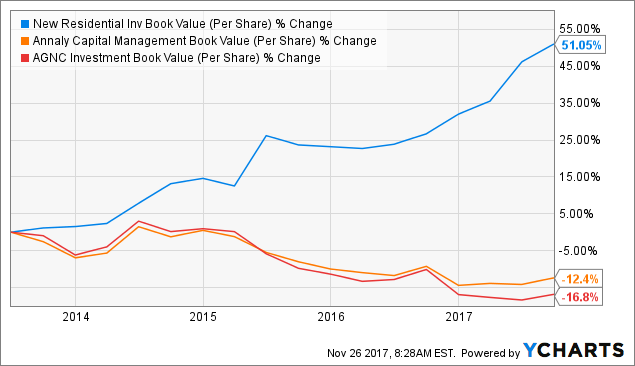 A premium to book value basically means the market is valuing the company for more than the value of its loan portfolio, which is a strong endorsement of management’s skill. For example, with shares currently trading at 20% above book value, it means that shareholders are saying that each $1 in NRZ assets they buy will be worth at least $1.20 later, because of confidence that management will continue executing well on its long-term growth strategy. Or to put another way, at the current share price, NRZ is able to effectively print free money ($0.17 per $1 in shares sold) with which to invest in its highly profitable loans. However, as you can see, at times fickle investor sentiment means that NRZ’s shares sometimes trade below book value, meaning that any shares sold at those times (to raise equity growth capital) will be destructive to shareholder value. The bottom line is that NRZ is a highly complex, “black box” of a financial company, which has so far enjoyed stupendous growth courtesy of excellent investments by management, but also a steady, long, and accelerating economic recovery. And as its loans mature, there is a large risk that management will find it much harder to invest as profitably as in the past without taking on a larger amount of credit risk that could blow up in its face come the next recession (more on this in a moment). 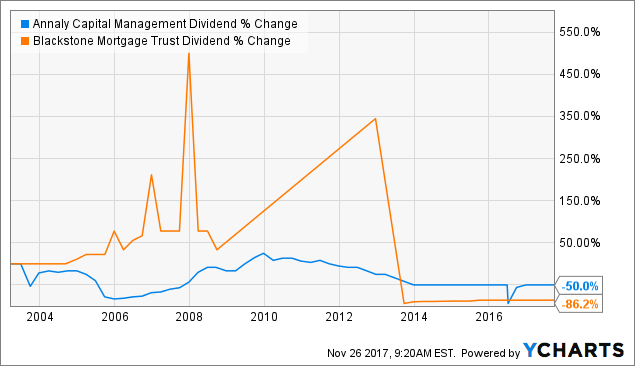 The only reason for owning any high-yield stock is ultimately the payout profile, meaning a combination of: yield, dividend security, and long-term growth prospects. My goal as an investor is to avoid dividend cuts whenever possible, including during recessions. 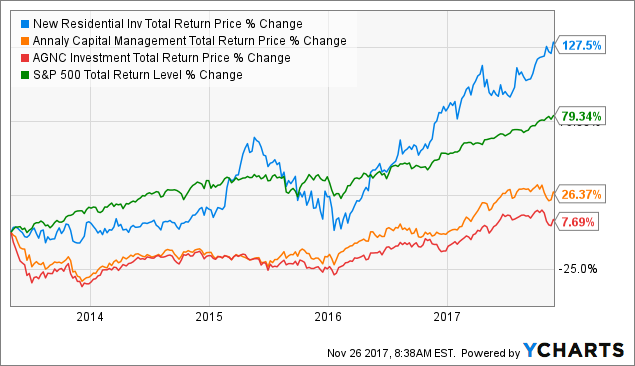 This makes mREITs a highly challenging industry because even the best mREITs, both residential and commercial, have a poor history of maintaining steady dividends during economic downturns. This is why I’m planning on eventually reducing my holding of NRZ to 2.5% of my portfolio, which is my targeted position size for high-risk stocks, meaning those whose dividends I’m uncertain can survive the next recession. The high risk is also a function of the unpredictability of NRZ’s underlying business model, one in which it’s impossible to predict how profitable the company’s future loans will be. That means that the variability in the long-term dividend growth rate is very wide. In fact, I estimate that over the next decade, NRZ’s CAGR payout could vary anywhere from -5% (bad recession) to 5% (no recession). Analyst consensus is basically for the midrange of that estimate, at 1%. Or to put another way, NRZ’s highly uncertain dividend growth rate means that its total returns could be anywhere from 6.2% (market loser) to 16.2% (double the market’s likely return from current valuations). Over the past year, NRZ has crushed the market, which isn’t surprising given Wall Street’s love of fast growth. However, that means that NRZ is far from a deal today. I like to value mREITs on two main metrics, the price to book value and yield, both on an absolute basis and relative to historical norms. 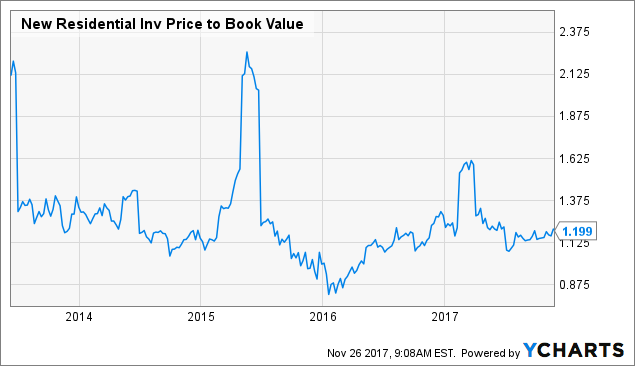 Today NRZ is trading right smack in the middle of its historical price to book value and yield ranges, meaning that shares are likely fairly valued. However, note that the yield has been higher than today’s 62.6% of the time since its IPO, indicating that if you’re patient, you can likely get a better price and higher yield. Of course, that’s assuming you are comfortable with owning a high-risk mREIT at all, because it’s extremely challenging to model the intrinsic value of this company. For example, with high-yield stocks like this, I generally like to determine intrinsic value based on a discounted dividend growth model. That means using a 9.0% discount rate (historically the post expense CAGR return on an S&P 500 index ETF since 1871, and thus the opportunity cost of money) to determine the net present value of a stock’s future (20-year) dividend flow. Of course because NRZ’s business model is highly unpredictable that means we get a huge variance in estimated fair values, ranging from $13.39 in a bearish scenario (33% overvalued) to $27.64 (35% undervalued) assuming that management can maintain strong dividend growth over time. The likely case, at least according to analysts, is for NRZ to basically maintain a flat payout over time, which means its shares are fairly priced today. However, remember that any valuation model is a best guess at future earnings and payouts. That means that any fair value estimate is always a moving target, one that’s adjusted as actual results come in. 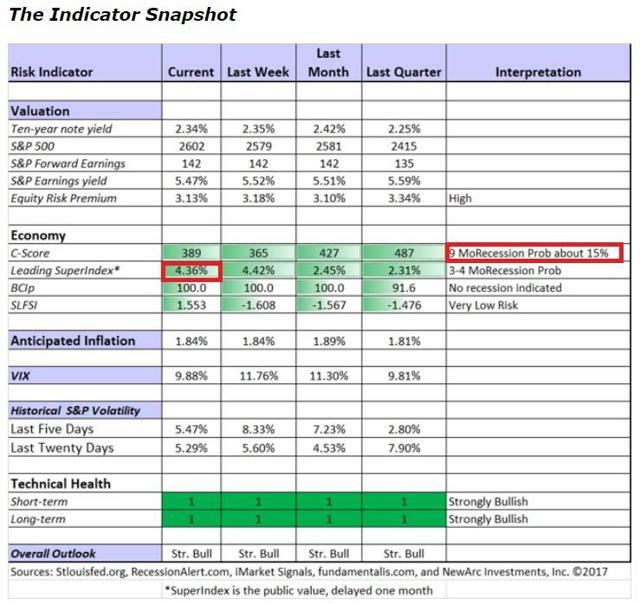 Which brings me to the biggest risk for NRZ, a recession, and how I plan to not just reduce my position before that happens, but how I plan to recognize when the next downturn is likely on its way. 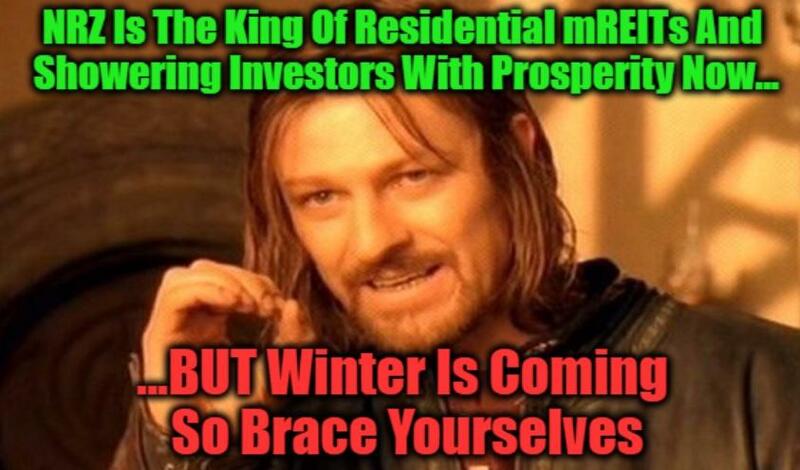 I view residential mREITs, including New Residential Investment Corp., as mostly “fair weather economic friends” meaning that a recession is likely to wreak havoc on earnings due to rising loan delinquencies and outright defaults. That means that investors need to manage their risk when it comes to how large a percentage of your portfolio any stock is, based on its dividend risk profile. That’s how I think of dividend risk, and the long-term plan I have for right sizing my position sizes to adjust for long-term risk to the dividend. Now I’m gradually updating my portfolio (as one must do in a rapidly evolving world), which means that today NRZ is about 10% of my holdings and about 4X overweight. However, given the strong fundamentals so far, and the fact that the growth winds remain at NRZ’s back for now, and as long as the economy keeps growing, there is no need to run out and immediately sell 75% of my position. Rather my plan for trimming NRZ down to an appropriate size is based on my best guesstimate of when the economy will peak. Of course this is very hard to do in real life, which is why the common joke is that economists have predicted nine of the last five recessions. Which means that rather than simply “ringing a bell at the top,” I’m focused not so much on any individual economic metrics, but longer-term trends of several key metrics. The first is the yield curve, specifically the 2- and 10-Year US Treasury spread. An inverted 2-10 curve, meaning that 2-year US bonds yield more than 10-year bonds, has “predicted” five of the last recessions (going back to 1976), with an average lead time of 12 to 24 months. Of course in reality things aren’t that simple or clear cut. Basically the idea behind a yield curve inversion is twofold. First, because bonds markets are largely a long-term vote by investors on future economic growth and inflation, if a short-term bond yields equal or more than a long-term bond, it basically means that bond investors are expecting little or no economic growth or inflation in the future. In other words, there is no risk premium for owning longer duration bonds (tying up your money for longer) because bond investors are bearish on growth and potentially expecting inflation to remain flat or even potentially negative. Fundamentally there is also a plausible reason that an inverted yield curve can potentially signal a recession. That’s because financial companies, such as banks or mREITs effectively borrow at short-term rates, to invest in longer-duration assets. The spread between these is where profits are generated. Which means that if the yield curve is steep, banks and other financial institutions have large incentives to do brisk business, such as loan to consumers and businesses (or buy mortgage backed securities and thus help fund the housing market). However, if the curve inverts, then financial companies can’t make a profit, then loans dry up, credit slows or shrinks, and consumer and business spending ends up declining; potentially triggering a recession. So those are the basic theories behind the yield curve and why it’s worth watching. However, keep in mind that while the correlation between inverted yield curves and recessions is strong, that doesn’t necessarily mean that the causation is real. For example, the US has had 47 recessions or depressions since its founding, or an average of one every 5.1 years. Thanks to greater involvement by the Federal Reserve, this has now increased to about a recession every 8 to 10 years. However, with a one- to two-year lead time, it’s possible that the yield curve’s predictive power is potentially overstated (since it covers a relatively large amount of time). That being said, I do consider the yield curve to be worth watching, and since the start of the year (when optimism about reflation and faster economic growth was at its peak), it has been steadily declining. Going forward, the Fed’s accelerating roll-off of its balance sheet should help to push up long-term rates (due to less Fed buying of long-term mortgage and US Treasury bonds), however, that could be offset by up to six rate hikes the Fed is currently planning through the end of 2019. While short-term rates aren’t directly controlled by the Fed (it only raises and lowers the Fed Funds rate which is the overnight interbank lending rate), the Fed’s rate hikes do have an indirect effect on borrowing rates because they are one of the benchmarks used by financial institutions for determining what rates they lend at. In other words, the current yield curve trend, while troubling, is far from spelling economic doom anytime soon. Of course trying to predict something as complicated as economic growth and recessions requires more than just a single metric. Which is why I’m also looking at a meta analysis of leading economic indicators, which is tracked brilliantly by Jeff Miller in his weekly market/economic updates. 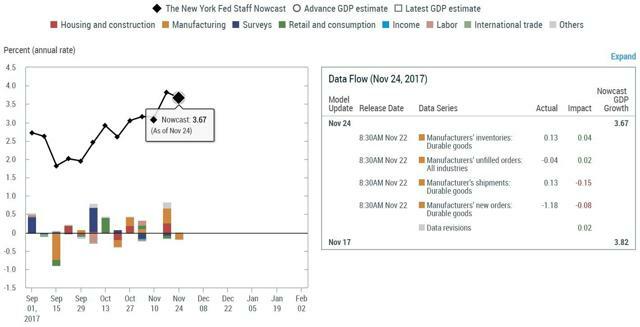 Currently the economic outlook is largely positive, with economic data, according to the New York and Atlanta Feds, signaling accelerating economic growth. Meanwhile the three- and nine-month recession risk of about 4.4% and 15%, respectively. While no economic model, including the Atlanta and New York Feds’ is perfect, should US economic growth indeed come in at 3.4% to 3.7% in Q4 that would mark the first time since 2004 that the US has seen three consecutive quarters of economic growth. What’s more, the growth rate in all three quarters would be accelerating indicating a potentially very positive trend. That’s especially true given that the labor market remains strong, and eventually, wage growth should start to rise faster than the 2.5% YOY pace we’ve seen most of this year. Higher wages with muted inflation would mean stronger real purchasing power and could further boost consumer spending and economic growth, as might tax reform (about 0.3% by most analyst estimates). The continued strength in consumer and business confidence (highest since 2000). The fact that 75% of major world economies are now growing simultaneously. 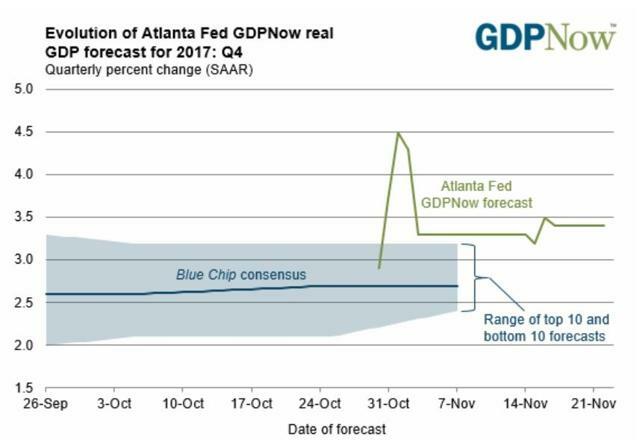 The bottom line for recession risk is that chances of a near time economic downturn are far lower than most would think, given the length of this economic recovery. That being said, any given data point is just a snapshot in time so it’s important to keep in mind the longer-term trends of these metrics. So how exactly do I plan to use a holistic approach to watching economic trends to time my trimming of my NRZ position in the future? Now these are somewhat arbitrary exit points, and everyone needs to manage their portfolio risk in whatever way they are most comfortable. However, I believe that the above plan will maximize the chances of reducing my position in NRZ to an appropriate risk-adjusted size for my goals, and do so long before the next recession strikes (whenever that may be). Don’t get me wrong, when it comes to residential mREITs, literally no one does it better than New Residential Investment Corp. The highly profitable niche that management has proven itself an expert in makes it by far the most appealing choice in this high-risk industry. But that doesn’t change the fact that NRZ is still a high-risk dividend stock, one that should only make up a small to modest position in a very well diversified high-yield portfolio. Because, while the current risk of a near-term recession is low, at some point one will invariably strike, and at that time, the last thing you want to do is be overly exposed to a highly risky dividend that may end up getting slashed. Disclosure: I am/we are long NRZ.